SPRINGFIELD, Mo. 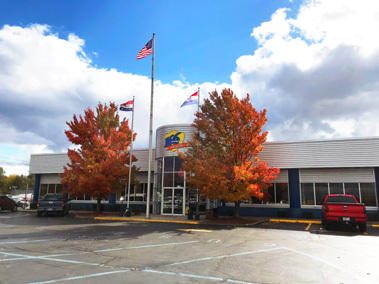 — 166 Auto Auction in Springfield, Missouri, will celebrate its 70th Anniversary on April 25. Founded by Melvin Reid in 1949, the auction is still located on the original property which has expanded to 50+ acres. Melvin and the team at 166 Auto Auction started selling dealer consignment inventory and grew to remarket cars in large volumes for consignors such as Ford, GM, GMAC and Chrysler, as well as many national banks. Melvin sold the auction in the late 1980s to Manheim auto auctions. The original name was kept for a while, and 166 Auto Auction started a Specialty Sale selling boats, RVs, campers and motorcycles in addition to auctioning cars and trucks. This sale was very successful and still operates to this day on the third Thursday of every month. 166 Auto Auction also has a salvage and inop sale every Thursday morning. With several renovations throughout our 70 years, 166 has grown from a small building with dirt floors to a full-service 8-lane auction. We went from a collection of small buildings for recon to a state of the art 42,000 square-foot retail collision center that serves both the retail public and our auction customers. We also have a 10-bay mechanical shop that completes hundreds of pre-sale and post-sale inspections for our clients each week as well as serving the retail public. Our detail facility is now housed in its own three-lane building, which has come a long way from being operated out of one of the auction lanes many years ago. 166 Auto Auction has boasted many firsts and successes in its history. It was among the first to develop a computer system, which was then sold to other auctions. We had the first million-dollar sale for Ford Motor Company and one of the first Simulcast sales for Ford.